Luc Bas is the director of the European Regional Office of the International Union for Conservation of Nature (IUCN). Europe has just a few truly wild places left in its heavily industrialised and urbanised environment. One such spot is the world-renowned Bialowieza Forest, which is just a small reminder of the once immense primeval forest that covered much of the European Plain. 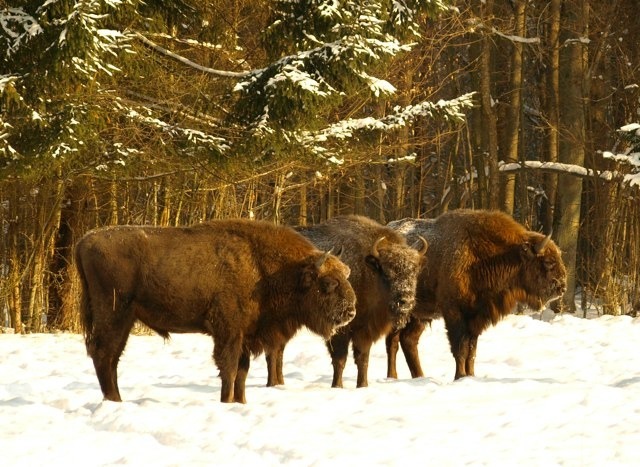 Sharing a border between Poland and Belarus, Bialowieza boasts exceptional biodiversity full of unique species, is home to Europe’s largest free-roaming population of bison and has been protected for many hundreds of years. Bialowieza is not just a Polish heritage but a true European one: the Bialowieza primeval forest is a World Heritage Site and forms part of the Natura 2000 network. But in March, because of an outbreak of bark beetles that attack and can kill thousands of spruce trees, the Polish Ministry of the Environment gave a permit which is reported to increase the amount of timber logging more than threefold for a ten-year period, to around 188,000 cubic meters annually. In the event that logging activities are so dramatically expanded, scientists warn that the future of the forest could be at stake. It could well turn into a place with less biodiversity and more human interference, becoming just another ‘managed’ forest. Renowned Polish scientists, NGOs and local groups are all challenging the government’s approach. In several open letters and reports, scientists state that the measures applied to Bialowieza will do more harm than good. They argue that natural beetle outbreaks are common, spruce trees recover quickly, and nature even has a natural response as predatory beetles thrive in an environment full of dead spruces. Taking away the dead trees actually hinders the spread of the predatory beetles whose menu consists of bark beetles. Moreover, in order to stop the beetle attack in a managed way, at least 80% of the spruce trees would have to be removed. This simply is not possible because the wider region of Bialowieza is divided in several interconnected zones, including large reserves and park areas that may not be touched. Another crucial argument against human intervention, say the scientists, is that the current outbreak is not particularly – up to 90% of the spruce trees will survive it. Bialowieza is particularly rich in biodiversity linked to dead wood and decaying forests, such as fungi, lichens and insects. Several threatened species that feature on the IUCN Red List may be affected by increased logging, such as woodpeckers and many rare beetles. There is another important consideration in this debate, linked to excessive timber extraction during the past years: the National Forest Holding appears to have run out of logging permits set for the period 2012-2021 in the Bialowieza Forest. Those logging limits have been agreed upon after negotiations with both local communities, who benefit from the logging through income and building materials. The European Commission was about to start an infringement procedure some years ago, because the Natura 2000 site was logged too intensely in the first decade of this century. This procedure was aborted only after Poland promised to limit the felling of (sometimes ancient) trees. But after just four years of logging, the three districts of the Bialowieza Forest where permits have been given are reported to have extracted almost ten years’ worth of timber. A fierce debate is now ongoing within Poland: scientists, NGOs as well as many local groups are opposing the drastic expansion of logging activities. NGOs filed a complaint at the European level. The European Commission has expressed its worries about the government’s plans in a letter in January. Earlier this month, the Commission entered the next phase of a possible infringement procedure by sending an ‘EU Pilot’ letter to Poland, stipulating breaches of the EU’s environmental laws and Natura 2000 regulations. All parties involved must reach an agreement on a future of the Bialowieza forest that will ensure the protection of its global and European nature conservation values. The scientific community’s concerns about the current plans are significant. Short-term commercial interests should not prevail over the long-term protection of Bialowieza. The outbreak of the bark beetle population can be dealt with by nature itself. Forests are extremely complex, dynamic ecosystems and Bialowieza has survived big (climatic) changes in the past. But the current Polish plans might lead to the destruction of a large part of the remainder of Europe’s most important, ancient and primeval forest. The Polish government would do well to further discuss with scientists and relevant stakeholders to reach an agreed and different way forward that will address the current concerns about its plans. Both the European Commission and UNESCO (to which IUCN has an advisory role) should follow the case closely and take action if needed to ensure a sustainable future for Bialowieza. Forests are extremely complex but NGOs and sceptical scientists know better. Of course the fact that countries like Finland and Sweden have both environment and economy going together is not of importance. The way to improve managment in forests is not to leave them to die, but to….improve the management. Nobody is suggesting that leaving forests to die is a way to improve management, in fact nobody is suggesting to leave Bialowieza to die. The idea is not to destroy its diversity by excessive interference.